Summer Rental in Trinity Park: 3 BR house available for rent from approximately June 26 until August 12, though the dates are somewhat flexible. For more information contact lesliewinner@gmail.com. Beth El Francophiles meet twice a month at the Levin JCC in Durham. The Refresher group meets from 7 to 8 PM on the second Monday of every month. The Conversation group meets from 7:30 to 9 PM on the fourth Monday of every month. *Francophile: a person who is fond of or greatly admires France or the French. Did your ancestor serve in the Civil War? Make sure they are on the Shapell Roster of Jewish Soldiers Who Served in the American Civil War. Their searchable database, which will be free to the public online, will go live with a limited set of records in 2019. Contact Eliza, eliza@shapell.org, to connect. 18-24 Months — Start Preschool Now! Center for Holocaust, Genocide and Human Rights Education of NC, Inc. The Holocaust Speakers Bureau (a component of the Center for Holocaust, Genocide and Human Rights Education of NC, Inc.) seeks children and grandchildren of Holocaust survivors and concentration camp liberators (known as 2Gs and 3Gs). The Holocaust Speakers Bureau visits schools, houses of worship and organizations throughout the year to share the experiences of the Holocaust through eyewitness testimony. Since it is becoming increasingly more difficult for survivors and liberators to participate, we are seeking to expand our speaking network to include 2Gs and 3Gs. Please contact Sharon Halperin via email or at 919-933-9089 if you are interested or would like more information. The Lerner School has programs for children of all ages throughout the year available to the Jewish community. Programs include Shmooze n’Play, Shabbat Together, and Jewish Story Time. Lerner Jewish Community Day School is looking for substitute teachers and dedicated volunteers! Those applying for substitute teaching should have some experience as an educator as part of their resume. Those interested in dedicated volunteering, should have a big heart, adore children, and at least one hour of dedicated time they can lend once a week or every other week! Background checks will be necessary for both roles. If interested, call 919-286-5517. Check out Family Storytime at the Levin JCC each Friday from 9:45 am! Run on Team Sharsheet in the TCS NYC Marathon! Urban Ministries of Durham is in need of underwear for men and women (new only, please). Use the Amazon Wishlist to send donations directly to UMD right now, or drop your donations by the Resource Center, 410 Liberty St., Durham, Monday -Friday 9-6 pm and Saturday 10-4 pm. On the 1st and 3rd Wednesday of the month, Jewish Family Services provides a program and lunch for seniors in our community. This is a wonderful opportunity for our elderly seniors to get together on a regular basis, spending time together chatting over a good lunch. We are looking for small groups of friends, such as a family or two, a Hebrew school class, a B’nai Mitzvah student to consider preparing or sponsoring ($100 donation) a lunch in honor or memory of someone or just for the fun of it, for between 15 – 20 seniors. This is an easy and wonderfully rewarding mitzvah opportunity. For more information please contact Michele Pas at mjbpas@aol.com or 493-3175.
Who We Are: A group of single Jewish people who meet quarterly for the purpose of performing mitzvot and attending social, cultural, or religious events while providing an opportunity to meet other Jewish Singles in a pressure-free environment. (336) 852-4829 x 227, gbretan@shalomgreensboro.org. Jewish Family Services (JFS) is recruiting caregivers and individuals who are caring for a loved one who are in need of support or want a safe place to talk about the challenges and rewards of caring for a loved with dementia or a chronic illness. JFS licensed clinical social work staff help facilitate a group where people share ideas and strategies for managing their loved one and taking care of themselves. Meetings are confidential and held at the Levin JCC in the JFS Meeting Room. 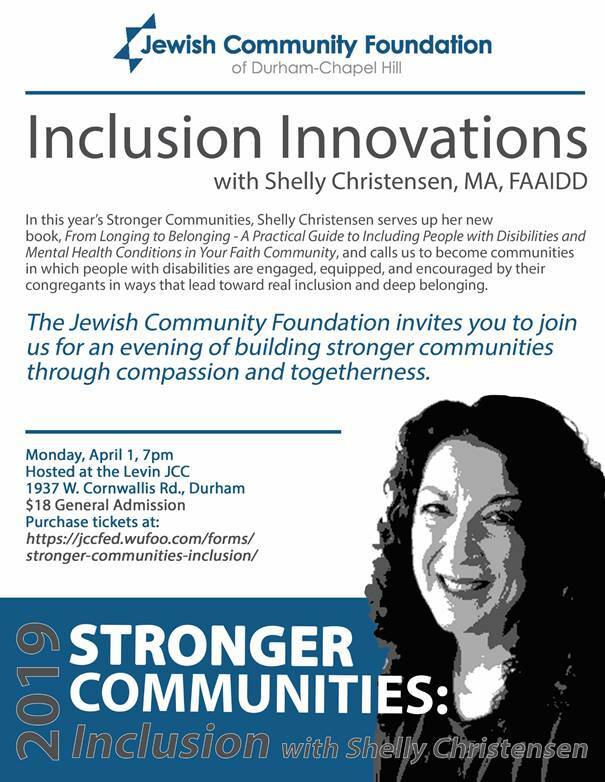 For more information on this free support group program, please contact Donna Rabiner, JFS Director, at 919-354-4922 or drabiner@shalomdch.org or contact Jennifer Schwartz, JFS Social Worker, at 919-354-4923 or jschwartz@shalomdch.org. Are you currently battling compulsive overeating, alcoholism, or another addiction? Do you want a Jewish environment to help with your recovery? JACS is dedicated to: Encouraging and assisting Jewish alcoholics, compulsive overeaters, and chemically dependent people and their families, friends, and associates to explore recovery in a nurturing Jewish environment. JACS is meant to be a supplement to a 12-step group (such as AA, OA, NA, Al-Anon, etc) for Jewish individuals. For more information call 676-2200 x126 and leave a message on the JACS confidential mailbox and a JACS member will return your call. “Chaverim” means “friends” in Hebrew. The Jewish Family Services Chaverim program is an opportunity for older adults to learn, meet new people, and schmooze over a meal . You can make new friends and connect with old ones. Programs scheduled monthly. Contact the Durham-Chapel Hill Federation for information. Need a Ride to Chaverim? Transportation is provided. Call Ric (919-354-4925) or Lisa (919-354-4923) by the RSVP date to schedule your ride. Programs are subject to change. If, on the day of the program you are feeling cold or flu like symptoms, please take care of yourself and your community members by staying home. Thank you. The Jewish meditation group is a participant-led meditation group that brings together mindfulness meditation with Jewish teachings and other practices. In this group, we combine silent practice with time for reflection and contemplation on a variety of Jewish themes. Leaders rotate throughout the year, so every meeting has a bit of a different flavor. We welcome people at all levels of experience with meditation, including no prior experience. This practice can be very beneficial in helping us manage stress and other difficulties, helping us feel happier and more relaxed. It chronicles the story of Jewish settlers in the South and their descendants, from the late 1600’s through the 21st century. The site includes portraits, maps, historical documents, ritual books and objects, photos, and oral histories. The accompanying text provides context and explanation. The library’s web team, advised by the North Carolina Collection Gallery, programmed the site, which was based on a traveling exhibit developed by the College of Charleston. Students, faculty and staff at the University of North Carolina at Chapel Hill and Duke University have access to what is thought to be the world’s largest visual history due to the Renaissance Computing Institute (RENCI) deploying a 5.5-terabyte digital media cache of testimonies from the University of Southern California Shoah Foundation Institute’s Visual History Archive. The general public may access the archives as well at Duke’s Perkins Library, UNC’s Davis Library at UNC, and NC State’s D.H. Hill Library, where special listening/viewing areas have been set aside. Dr. Sheva Zucker offers Yiddish classes for several levels. Call 919-286-1641 or email sczucker@aol.com for registration and information. Classes are small and informal, serious and lots of fun! All classes are 1 1/2 hours long. Beth El member Sheva Zucker is the author of two Yiddish textbooks which are widely used in adult and university classes throughout the world. She has taught and lectured on Yiddish and Yiddish literature on five continents. She taught Yiddish and Jewish Literature for a number of years at Duke University and in the Uriel Weinreich Intensive Summer Yiddish Program sponsored by Bard College and the YIVO Institute for Jewish Research in New York City. She is the editor of the Yiddish periodical Afn Shvel and the executive director of its publisher, the League for Yiddish.